Identifying the mechanisms of colony reproduction is essential to understanding the sociobiology of honey bees. Although several proximate causes leading to the initiation of queen rearing – an essential prerequisite to swarming – have been proposed, none have received unequivocal empirical support. Here we model the main proximate hypotheses (colony size, brood comb congestion, and worker age distribution) and show that all proposed swarming triggers occur as a function of the ultimate cause of a colony reaching replacement stability, the point at which the queen has been laying eggs at her maximal rate. We thus present a reproductive optimization model of colony swarming based on evolutionary principles. All models produce results remarkably similar both to each other and to empirically-determined swarming patterns. 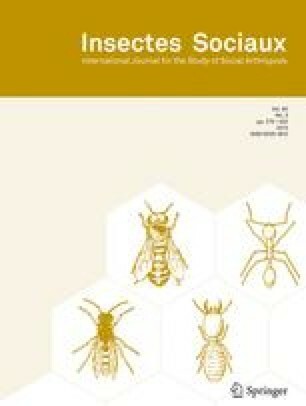 An examination of the fit between the individual models and swarm-preventing techniques used by beekeepers indicates that the reproductive optimization model has a relatively broad explanatory range. These results suggest that an examination into the behavioral correlates of a queen’s maximum egg laying rate may provide a unified proximate mechanistic trigger leading predictably to colony fission. Generating a predictive model for this very well studied animal is the first step in producing a model of colony fission applicable to other swarm-founding eusocial animals. Received 16 November 2004; revised 31 May 2005; accepted 27 June 2005.